Northern Ireland's first power-sharing assembly has collapsed. Its leader, Brian Faulkner, and fellow members have resigned, leaving Northern Ireland facing direct rule from Westminster. It follows a seven-day general strike organised by militant unionists opposed to the Sunningdale agreement. Over the last week industrial production has come to a halt with power cuts of up to 18 hours. Rubbish has not been collected and there have been reports that undertakers would not bury the dead. Last year, the British Government under Edward Heath held talks at Sunningdale in Berkshire with the government of the Irish Republic and three political parties - the Official Unionists led by Mr Faulkner, the nationalist SDLP and the non-sectarian Alliance. They agreed to set up a power-sharing executive for Northern Ireland and, eventually, a Council of Ireland involving the Republic with limited jurisdiction over issues of joint concern between north and south. The declaration also recognised the wishes of unionists to remain within the UK and nationalists for a united Ireland. Both sides agreed the will of the majority should be respected. But hardline loyalists - led by Harry West, Ian Paisley and William Craig - did not attend most of the talks at Sunningdale, and when the proposals were announced, they criticised them strongly. The new executive took power formally on 1 January this year but soon ran into trouble. Anti-power sharing unionists did their best to disrupt proceedings and 18 members including Ian Paisley had to be forcibly removed by the police. In February, a general election saw Labour returned to power in Westminster and 11 of the 12 seats in Northern Ireland won by unionists opposed to the deal under the umbrella of the United Ulster Unionist Council. Of those supporting the executive, only Gerry Fitt was elected as the UUUC won more than 50% of the vote. With the Sunningdale executive teetering on the edge, the coup de grace was delivered by the loyalist Ulster Workers' Council, which organised a seven-day strike after the assembly approved the agreement last week. Direct rule was re-imposed by Northern Ireland Secretary Merlyn Rees and the assembly prorogued. There were several unsuccessful attempts in the 1980s to set up power-sharing government in Northern Ireland. Northern Ireland's first power-sharing assembly finally came into being in June 1998 after a referendum on the Good Friday Agreement, the 1990s equivalent of the Sunningdale agreement. Disputes over decommissioning and policing led to the suspension of the Northern Ireland Assembly twice in 18 months - in February-May 2000 and in August 2001. 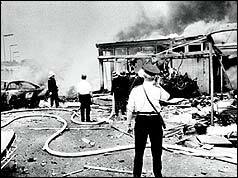 It was suspended again in October 2002 over allegations of IRA spying within the Northern Ireland Office.